Sometimes layers offer solutions that cannot be delivered through single layer constructions. We see a range of applications for our multilayer constructions. For balloons, multiple layered materials offer combined mechanical properties. For inner slip and outer softness, a tie material binds the slip and soft radiopaque layers for a high performance tube. The photo you see here is a jacket tube awaiting reflow assembly. 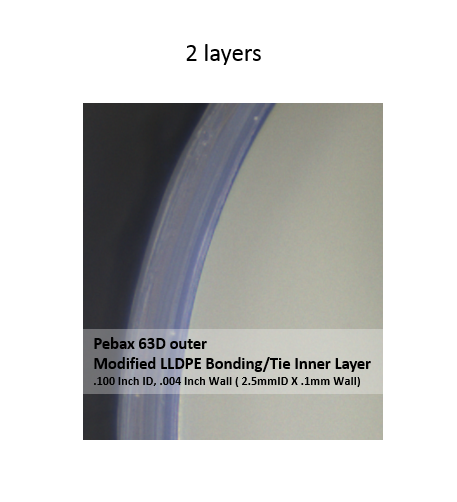 This extrusion combines a Pebax 63D outer layer with a modified LLDPE inner tie layer to provide bonding to substrate layers. Unlike many of our custom extrusions which deliver microsizing and ultra thin walls, this is a “big guy”. The inside diameter is .100 inches (2.5mm) and the total wall thickness is .004 inches (.1mm). The inner tie layer is .001 inch (.0254mm). The one, two and three layer extrusions are produced using three microextruders, integrated to deliver precise layers. High concentricity, key to balloon and reflow applications, is held to greater than 90%. Multiple layers and precise control are powerful elements of design for emerging disposable medical device designs. To learn more, please contact us to explore how our unique capabilities can support your medical device designs.